As confronting as it may sound, many who enter the healing professions (psychologists, psychotherapists, counsellors, healers, pastoral workers, life coaches etc) are ambivalent about doing 'the work' on themselves. Whether you've had experience on the couch or not, we will explore many forms of receiving therapeutic support for the therapist from simply getting away to Ubud and confronting a hidden compassion fatigue, receiving physical body work therapies such as massage, walking, yoga and dance, to more traditional therapies such as weekly psychoanalytic Freudian, Jungian and Lacanian approaches, and why you might engage in a practice like this, and be exposed to being held over time as opposed to being fixed quickly.​ This training/retreat will be challenging, unifying, liberating as well as relaxing, creating a pathway toward safety, passion and vulnerability. If we are passionate about our role as therapists, the discipline requires we do our own deep exploration into subjectivity and radical receptivity. This retreat/training sets up the safe container to open the therapists personal attachment, lopsided intelligence lines of development and counter-transference issues in order to embrace the fullness of our own character development and the permission to become warmly professional as opposed to unnaturally clinically cold. You will not only come away feeling refreshed, past participants have commented on feeling re-invigorated and excited about re-entering the profession again after confronting for example an inner anxiety "I need to fix it", a voice which comes from attachment trauma, over-burdened with a responsibility to deliver correct technique and formula and keeping up with the latest modalities. You will nevertheless be learning up to date new techniques and formulas on this retreat, but one of many includes knowing the difference between when to apply which technique, how to apply it, and why technique is often secondary to the quality of your presence which recreates an intimacy to heal your clients original attachment trauma. Cost includes breakfast, accommodation ( 7 nights), pool, WiFi, workshop manual/inventory, transport within retreat times, massage, sauna & dinner on the second night. Full payment due 2 months before start date. Book early to avoid disappointment as availability is limited. The program is designed so you feel as though you're on holiday....with a rest day in the middle of the training. ​This training offers 30 CPD points for professionals who have spirituality, couples therapy, group work, personal development, mindfulness, integral psychology and being at the cutting edge of therapy as central to their learning objectives. ​The training will be compelling for therapists, GP's, psychiatrists, life coaches, social workers, chaplains, palliative carers and students who are interested in learning new ways to be with their clients in either short or long-term care. Delegates are not required to have experience in yoga, meditation or psychotherapy, as the foundations of each discipline will be explored. Finding your art in therapy by learning the art of humour, literature, music and sound, dance and colour expression. Learning how sound, music and certain frequencies assist in healing ADHD & Autism. Psychologist, (BSS Hons; MPsych Child & Family; M.A.P.S) Musician, Yoga & Zen practitioner, has over 15 years experience in the Community Health sector & for the last 7 years working privately in Melbourne helping individuals and couples heal. 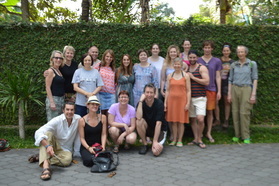 Nic has been travelling to Bali for a number of years running group professional development programs ‘The Psychology of Spirituality’, 'Therapy for Therapists' and ‘The Sacred Art of Relating'. His teaching style is influenced by his experiences in Hakomi, Insight Meditation, Mondo Zen, The Diamond Approach, Integral Psychotherapy, Imago & PACT (psycho-neurobiological approach to couples therapy). He has spent the last 3 years in weekly then fortnightly Lacanian psychoanalysis as an adjunct to what he brings to this next training. Carla van Laar M.C.A.T. has over 25 years experience working with people and the arts for health and well being and is currently completing her Doctoral research into ‘Seeing her stories’. She is the author of ‘Bereaved mother’s heart’ (2007) and a number of co-authored articles. Carla has held professional leadership roles in community organisations, justice, health and education contexts since 2000. Carla works as a sessional supervisor and lecturer with MIECAT and the IKON Institute in Melbourne. She is currently the Principle Therapist with VincentCare Victoria’s young adults counselling service where she loves working with young people experiencing homelessness. In private practice for over 25 years Jonine has created a unique synthesis and eclectic blend of traditional counselling and psychotherapy with alternative modalities and has a strong vision to create greater awareness of the link between unresolved trauma, loss and grief, and personal and global health and wellbeing. ​2-year practitioners’ trainings in Systemic/Family Constellations and Mindfulness based Breathwork therapy since 1996. Based on the Northern Beaches in Sydney she describes herself ‘as an eternal student of life and love, following my souls agenda and attempting to unravel the mysteries of life’. ​Paul North has been a practicing psychologist for over 30 years. 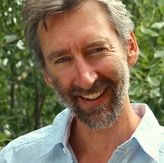 During this time he has worked within a developmental paediatric unit at St George Hospital, Sydney, lead a team of psychologists within a developmental disability focused government department for the southern region of NSW, run a successful private practice in Canberra and conducted and presented research in the area of mindfulness and compassion based meditation, nationally and internationally. In 2011 Paul met Prof Stephen Porges ( the creator of Polyvagal Theory) during a Sydney conference and struck up an immediate collegial friendship. Polyvagal theory now forms an integral part of his clinical practice and his trauma focused workshops. Paul was also trained by Francine Shapiro in EMDR in the early 90’s and this protocol also forms a cornerstone of his trauma therapy practice. In addition, Paul has for many years maintained a private and extensive interest in transpersonal psychology, altered states of consciousness and shamanic practices, following a deep and profound spiritual awakening in 1989. "This integral training has been electric....WOW...Thank-you". "My practice will be enriched by what I have learnt, firstly from self-healing and insights, and then ways of working with clients. The facilitation was great, beautiful, warm caring souls with a lot of knowledge and generosity. Thank-you for a wonderful week". "I can't wait to do more with you guys. The training covered so much depth, so much richness that an extra 7th or 8th day would have helped consolidate it better". "I particularly enjoyed the yoga, dance, nature walk, Balinese healing and sound meditation. The facilitation was amazing with a wealth of knowledge, passion and incredible skills and qualities brought to the group. I have lots of micro-skills to take away". "I have been enriched by the training. The personal journey has given me valuable insights into where/what I need to work on as a therapist. The model and workshop content has given me a lot to work with in my own time. The grounding practices were my favourite parts of the week". "The facilitation was flexible, responsive and created a safe space for exploration. Sensitive to the groups needs. Present. Open to being directed/organic. I now have techniques for recognising traits/dynamics in others and how to engage with techniques which will best serve their viewpoint/understanding". "My practice will be enriched due to my personal growth. My perception and attitude changes will transfer to more compassion, understanding and confidence in relating to clients. The Pyramids of Chi were fantastic". "I hoped for connection, refreshment and energising activation and I found those things. My take home for my practice is how trauma effects the exchange of energy flow, connecting with nature and how to work with dreams and getting in touch with my 'wild indigenous one'. Thank you for your gifted, creative, loving, present, sensitive, intuitive and generous facilitation. You are both experts in your respective fields and have read deeply and widely to bring your discoveries with passion to us". "This training was way better than I imagined it would be. It's given me many frameworks to work with personally and professionally. I have personally moved from 'struggle' to 'stability and vulnerability' which will give me the strength to hold the space for my clients...to connect more with my vulnerability to understand them. I learnt so much and am so grateful for this. The best part was getting out of my own head". "I'm now less in my head and more in my body. Mindfulness has been a massive take away message, including moving through pain via yoga- to allow it to come, to accept it, to not be afraid of the pain, to be patient and come home to myself and remember to love myself". "I'm taking away so much more self awareness about my body and how it moves, and being exposed to all the different ways to be with myself e.g. via the mask work. I have had many aha moments. It's been great". "The key thing I'll take away is to allow myself to get into a vulnerable state, and in combination with the integral practice I was taken out of my comfort zone which brought many insights about my need to control things". "I just love relating to the people this retreat attracts. I am becoming better at saying yes and no and things that I do and don't want to do. It feels awkward sometimes to confront stuff like that; to drop being nice". "I've discovered how to use my energiser more and also how to use my body more and help my clients become more grounded I will also take away the effects of the healing I received". "I have ploughed through a swamp and come out the other side to a fresh water lake". "It was challenging in a good way". "I'll be taking home a new found family. It's like discovering your tribe. Members of your tribe coming together and that's important to me. The save relationships inventory has given me great insight into how I relate to others. It's given me a whole new modality to work with when counselling couples". "This retreat has opened me up to another big chapter in my life". "I loved the people, the setting and the openness. I'll be telling my friends and colleagues about this". "Others can see I've transformed. it was a great opportunity to leave Australia and my comfort zone". "I had a gorgeous time with all these wonderful people and I have to come back again...so get here...be here...and don't miss out". "I loved being taken out of my comfort zone, and the content and the context and how the retreat has opened all my chakras". "A great opportunity to learn with like-minded people in the beautiful environment which was open, sharing, relaxing and energising all at the same time". "It's been a wonderful experience to join like-minded professionals in amazing ways doing body work, intellectual work and emotional work". "I loved the mix of people from the more spiritual approach in combination with the psychological approach and I loved the great discussions we had. The setting and the relaxed environment was really conducive to learning. I mostly enjoyed the mask workshop and visiting Anom the mask maker and the 5Rhythms". "A really transformational journey and I was able to connect back to myself and journey with other people who are in the same vibration as myself who are able to mirror me and it was empowering. I found a lot of strength and really looked at parts of myself I would like to work with and enhance and harness these qualities. I got a good look at an aspect of myself that maybe I wouldn't have seen before. I'm fully empowered". "I really enjoyed the openness, the beautiful people, the sharing, the safety provided for us to go out of our comfort zones which has really developed trust". "The retreat has broadened my horizons and given me a whole lot of of ideas to implement back in my work setting, and beautiful surroundings in which to emerse myself in different ways of thinking and to work with really intelligent capable people". "I'm discovering things I wouldn't have expected".